During the time at Bramshott James’ diary records more of his relationship with Lucy. 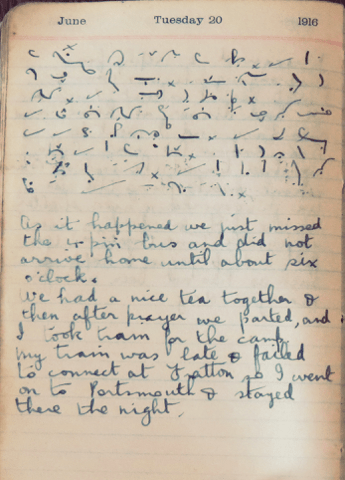 His thoughts find expression in Pitmans Shorthand, by which he can secure a little privacy. When he gets to the front however, he continues to use Shorthand for more entries; this, presumably, is because he was pressed for time. The 11th spent about one and a half months at Bramshott in preparation for the front. Every man was given a four day pass, in addition to requested passes, and the men were excited to see the capital; referred to as “doing” London. Nights back at the base were spent recounting stories of the men’s activities in the capital; “the beauty of the London girls,” fashion, and the soft, comfortable hotel beds were the topic of conversation in the less than comfortable tents at Bramshott. I left Haslemere a little after six and didn’t reach Bournemouth until after midnight. I found Vincent Ethel, Norah and Ruth waiting for me and we were all filled with joy at meeting. All were sitting up waiting for my arrival and our reunion was gladdening. Today I spent visiting friends etc. In the afternoon I went out for a cycle with Vincent and Norah. We went to Highcliffe and Mudeford and on the return home we called to see Mr. Barnard. We spent the evening at home. Went to chapel. It seemed natural to be back again. Mr. Small preached a very nice sermon. We spent the afternoon at home in the garden. In the evening we went to chapel again. On the Monday James telegraphed Lucy and she came down to Bournemouth for the day. James was due to be back at Bramshott on the Tuesday evening. After prayer with the family he took the train back to the camp. However, the train was late and he missed his connection. He had to spend the night in Portsmouth and arrived back at camp on Tuesday 21st.